Remember how last week we told you about the three common pain issues that a Tripawd dog or cat might experience? Today we’ll share ways you can help your animal avoid these painful conditions, be comfortable and pain-free on three legs. Please remember we are not veterinarians. This article is not meant to replace advice from your own veterinarian. Always seek help directly from your own vet to ensure your Tripawd hero lives a pain-free, hoppy life. Talk to your vet surgeon to ensure the latest veterinary pain management guidelines will be followed before, during and after surgery. 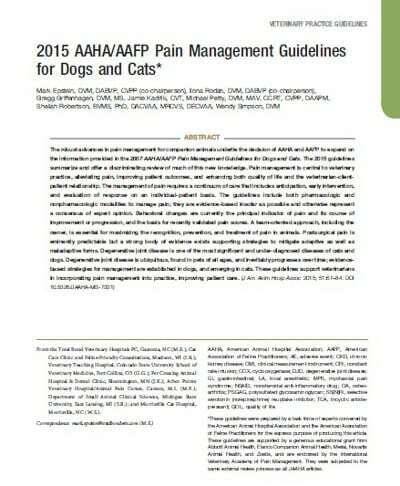 Is your vet following the newest pain mangment guidelines for dogs and cats? “I started her on 3 drugs the day before surgery. One is a Fentanyl patch applied to one of her back legs. This is a narcotic that lasts 3-5 days and will be removed Friday. The other drugs are gabapentin and amantadine. These are drugs used in human medicine and both are inexpensive and very safe. Gabapentin is used to prevent nerve root pain and thereoretically can help with “phantom pain“. We can’t ask our dogs about that but I think that it does exist! 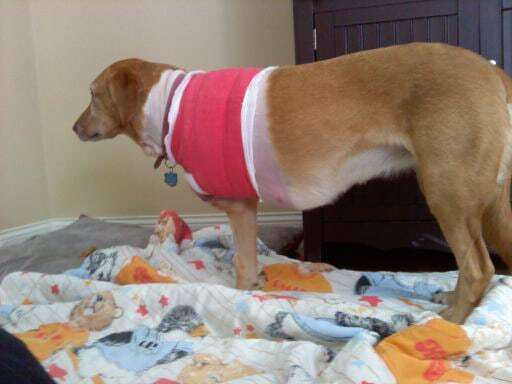 Gabapentin is continued for 2-4 weeks after surgery depending on the dog. Amantadine helps prevent what is called pain “wind up”. Once the pain receptors are annoyed it takes more pain meds to calm them down. This drug blocks that response and can be used for 1-2 weeks postop. Lots of dogs with chronic arthritis also take this drug for flare-ups when the Rimadyl or other NSAIDs they are taking stop working. These techniques are something your vet needs to do during surgery but you can talk to them about it for your own peace of mind and the comfort of your dog or cat. In his book “Dr. Petty’s Pain Relief for Dogs,” pain management expert Dr. Mike Petty offers tips for veterinary pain control during amputation surgery. “Local and regional nerve blocks with a drug called bupivacaine completely stop pain signals from reaching the brain and spinal cord when working on the front limbs. Not all Tripawds will show signs of phantom pain, hyperalgesia or Myofascial Pain Syndrome (MPS), but if yours does you can definitely do something about it. Gabapentin: For maximum effect, Dr. Petty recommends using gabapentin in conjunction with a NSAID like Meloxicam, Rimadyl, etc. It should be used with care in dogs with kidney issues. Side effects are typically sleepiness and diarrhea, both which usually dissipate in a few days. Amantadine: When used with gabapentin and a NSAID, Dr. Petty says this drug is one of the few that can help alleviate MPS symptoms. Nervousness and hyperactivity are two possible side effects. Tramadol: Effective in short-term use for acute post-op pain, but according to Dr. Petty, studies show it’s questionable when used for chronic pain. Side effects are similar to amantadine. Learn to massage your Tripawd. According to canine massage therapist Wendy Richardson, massage can begin 72 hours after amputation surgery, but no sooner. “Try not to massage directly after eating perhaps waiting a couple of hours and make sure your pet has relieved him/herself before beginning,” she advises. Follow her specific Tripawd massage tips here. Consider a Farabloc blanket. The Farabloc blanket is a non-pharmaceutical phantom limb pain therapy that alleviates pain in animals and humans by shielding the body from man-made and environmental electromagnetic fields (EMF). The Tripawds Gear blog has more detail. Unfortunately, at some point all of our Tripawds will need pain management assistance and it’s up to us to make sure they receive the very best care we can afford. 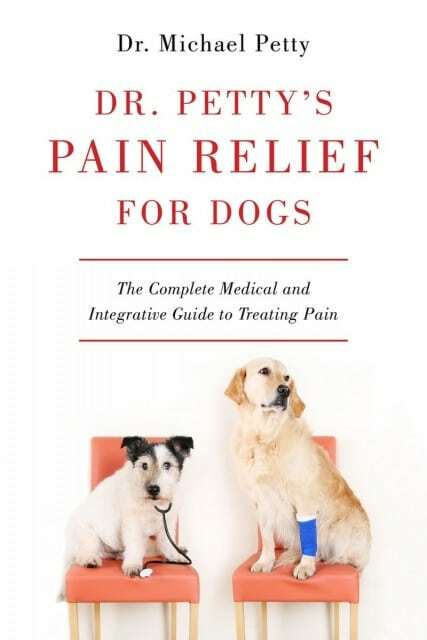 Please be sure to get your paws on a copy of Dr. Petty’s book to learn how (Dr. Petty tells us that a “Pain Relief for Cats” book is in the future, stay tuned!). How did you manage your Tripawd’s post-amputation pain? We’d love to hear your story, be sure to share your experience below. Thanks for the comment and best wishes for Whiskey! Glad you found these posts helpful. For help finding many other Tripawds resources and assistance programs, start here. Well thanks Sally. We strive to be useful AND showcase our gorgeous Tripawd heroes! As always, this site provides the most up to date information available for “everything tripawds”…and quad pawds too! Thank yiu for taking the time to post this valuable information. And seeing the magnificent Tazzie is a vonus!